September 17 - Saint Robert Bellarmine, Bishop and Doctor - Optional Memorial - My Catholic Life! A massive, multi-volume work of Christian theology was published in the 1580s refuting Protestant errors. The volumes were of such comprehensive and deep scholarship that readers assumed they had been prepared by an entire faculty of scholars. But they were the work of just one incredible man, today’s saint, Robert Bellarmine. He was a one man university. The Bellarmines had a pope in the family and gave their son a broad education from his youth. Young Robert mastered numerous subjects, including the art of playing the violin. He joined the Jesuits in 1560 and taught the classics while simultaneously studying theology on his path to the Priesthood. After his ordination in 1570, he became a professor at the University of Louvain, in modern day Belgium, and then at the Jesuit College in Rome. During his long career as a professor, Fr. Bellarmine never stopped learning. He was rigorous in his intellectual approach, read everything, and was particularly focused on refuting, with nuance, Protestant errors. He even learned Hebrew, and wrote a Hebrew grammar, to counter the thesis of a then popular Protestant history book. The times demanded that Bellarmine develop into an expert in apologetics, in total engagement with the red hot controversies of his day. This was not the age for theological speculation or philosophical rumination, as the medieval scholastics could indulge in. This was the age to master first principles, to delve into the ancient sources, to root our error, and to express the perennial truths of Catholicism with renewed vigor in a new language surrounded by new art, architecture, and sacred music. It was a total mind-body approach. It was the Baroque exploding before your eyes. It was the onslaught of the Counter-Reformation, and Robert Bellarmine was the tip of the spear. Bellarmine’s list of accomplishments are astonishing. He helped produce a new edition of Saint Jerome’s Vulgate Bible, participated in the revision of the Julian calendar, and contributed to the Catechism which the Church used for the next three hundred years. He served on a papal commission that arbitrated a major conflict over the Kingship of France, became a regional superior for the Jesuits, and was ordained a bishop and consecrated a Cardinal. He was a trusted adviser to successive popes, was tasked with resolving a bitter dispute over the theology of grace between Dominicans and Jesuits, and escaped being elected Pope himself by the narrowest of margins in 1605. After this near miss with destiny, he was appointed to serve on various Roman Congregations and as prefect of the Vatican library. So he resigned as diocesan bishop and returned to Rome for the rest of his life, where he became the Holy See’s most essential man. His long and faithful service at the highest levels of the Church culminated in his playing a role in the famous process against Galileo, who was Bellarmine’s personal friend. Our saint’s last years were spent writing devotional works on prayer and dying well. Robert Bellarmine accepted the trappings of his office—robes, servants, and a carriage—but he lived austerely and expected all priests to do the same. His virtues equaled his achievements. He had an attractive blend of warmth, intelligence, and big-heartedness that earned him a huge circle of friends. He knew the truth like few others but listened carefully and respectfully to all who challenged it. 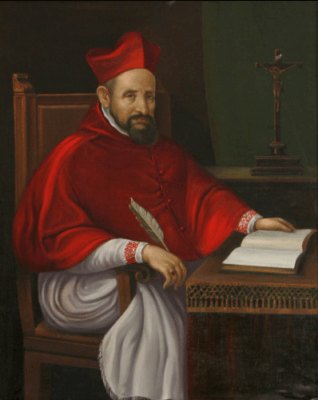 Robert Bellarmine was canonized in 1930 and declared a Doctor of the Church in 1931. He is buried in the Jesuit Church of Saint Ignatius in Rome. Saint Robert Bellarmine, we see in your life a beautiful dedication to theological truth, personal austerity, and openness toward others. We ask your intercession before God to give all the faithful the gift to live so balanced and integrated a life.